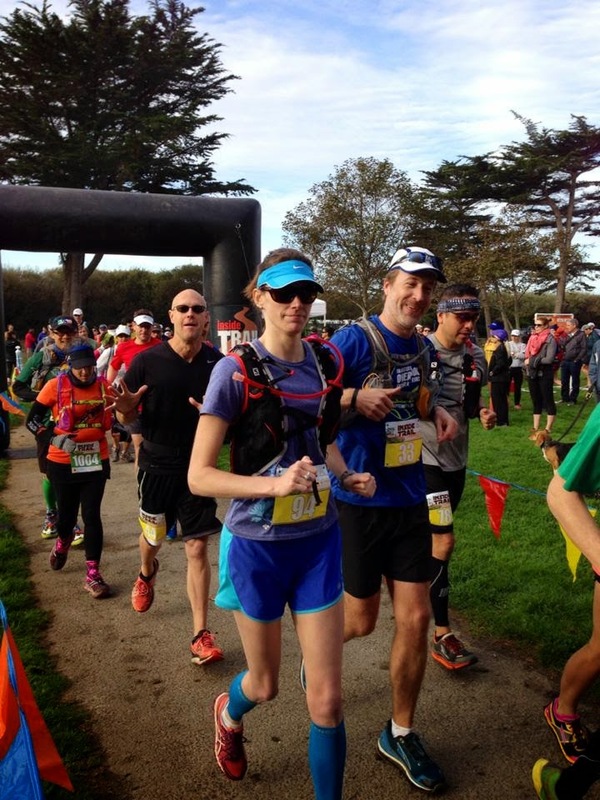 Before you remind me...I know I said I would never run Dipsea again and this year I sorta did. 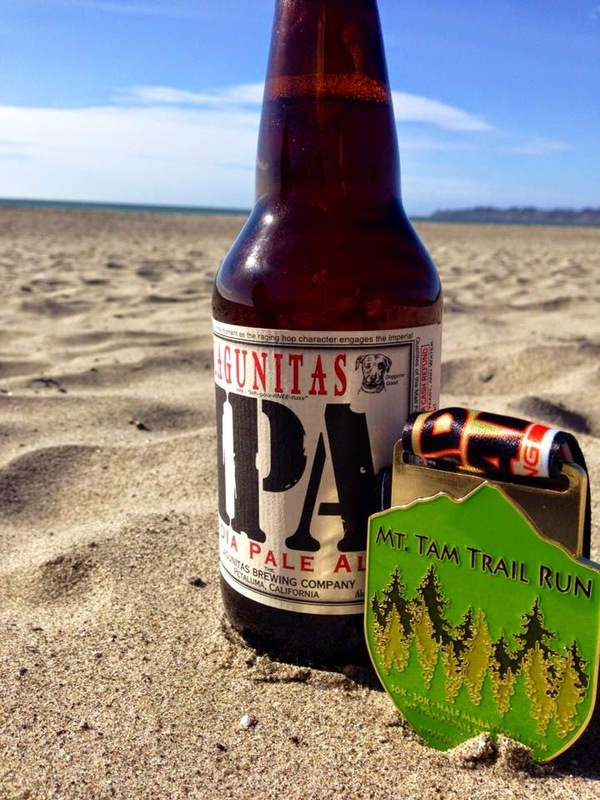 However, Inside Trail Racing's 'Mt Tam' race isn't the entire Dipsea down to Mill Valley just the Stinson Beach side. So, I only half lied! Course limited to just 400 (as opposed to the 2000 that get crammed on Dipsea). Challenging workout over rocks, exposed roots, steps and one vertical ladder. I took several shots before the 30/50K went out at 8:30AM but didn't realize my iphone was down to 1% battery and didn't have enough time to charge; so, no on-course pictures!! Ugh! 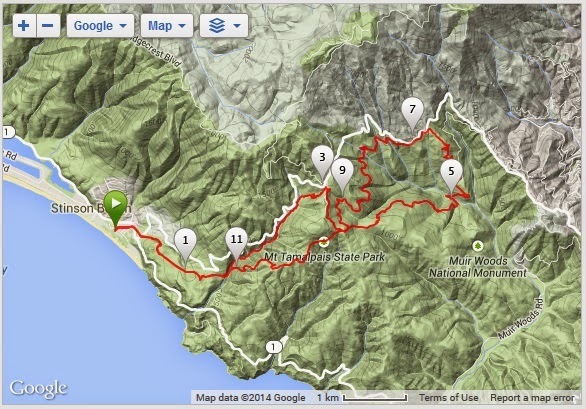 The half marathon has more than 3000 ft over vertical and runs the Stinson side of Dipsea and Muir woods. You go out on yellow ribbons, left on orange loop, then back on Yellow return. I never thought I was lost and there were even stripped ribbons for important and/or sharp turns. And Tim marked the wrong paths in blue ribbons. I remember one AS that you hit twice. For those of us that used hyropacks that was more than fine. If you ran with a handheld that might have been a bit tight. I wish I could have taken some pictures or had better command of English to describe the beautiful canopied single track we had the pleasure of running through. The brooks were actually babbling and the smell a mixture of salted air and forest. The floor was covered with needles, etc but those running in minimalist shoes were having a tough time with all of the small stones. The air was crisp and cool with a slight breeze. I couldn't image better running conditions. 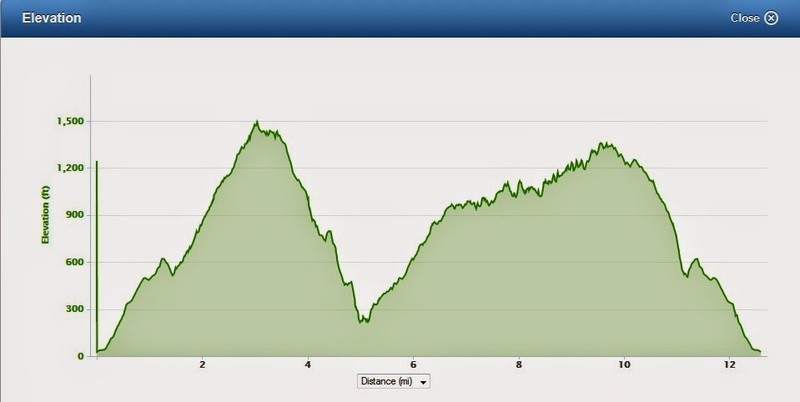 After you crest a tiny hill at 11 miles you run down towards the finish - a fine feeling. After passing the finish line the finishers table/beer was right there. Parking was a bit off but a nice cool down to change clothes, walk along the beach then back to the finish area to welcome others back. This was the best half marathon I've ever run and plan to be back next year.